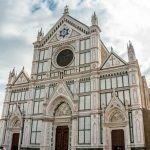 The construction of the Franciscan convent of Santa Croce was started in 1294, probably designed by Arnolfo di Cambio, who also designed Palazzo Vecchio and the Cathedral of Santa maria del Fiore. 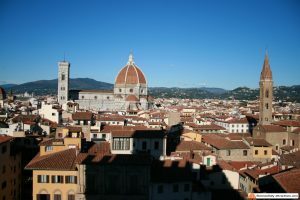 The Basilica is a gothic building, but located in the first cloister of the convent, stands the famous Pazzi Chapel, designed for the Pazzi family by Filippo Brunelleschi, one of the greatest examples of Renaissance architecture. The facade of the church was added only in the 19th century, by architect Nicolò Matas. 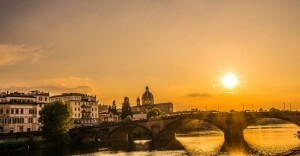 The Santa Croce area is one of the lowest of the city, and was heavily damaged by the flood of the Arno river in 1966. Among the symbols of the flood, the last supper by Vasari (still under restoration) and the painted cross by Cimabue, that was immersed into mud and partly lost forever. 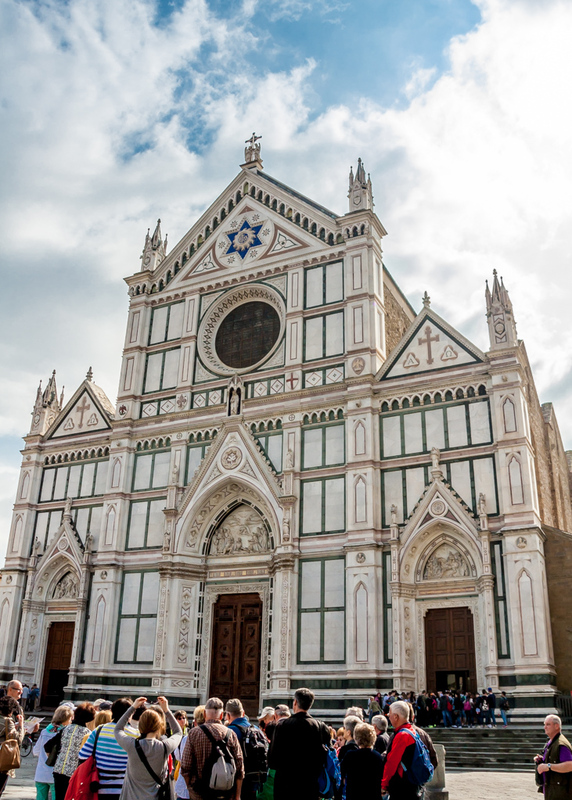 Santa Croce basilica contains many important tombs of famous Italians. Facing each other, we have the tombs of Michelangelo Buonarroti and Galileo Galilei, then the tomb of Niccolò Machiavelli, the politician, Gioacchino Rossini, the composer, Vittorio Alfieri, dramatist, and many more, including a tomb dedicated to Dante Alighieri, the most important Italian (and Florentine) poet, whose body though is not here, since he was banished from Florence at the age of 36 for his political opinions, and never came back to his town. When Michelangelo died at the age of 89, he had been in Rome for 30 years. 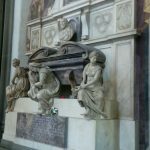 Pope Alexander III wanted to tribute him the greatest honor, being buried in St. Peter’s church, but Cosimo de Medici Grand Duke of Tuscany and all the city of Florence wanted their illustrious citizen to come back. Michelangelo’s nephew left Florence in a hurry and went to Rome, where he literally stole his uncle’s body, hiding it in a groceries cart and carrying him back to Florence. 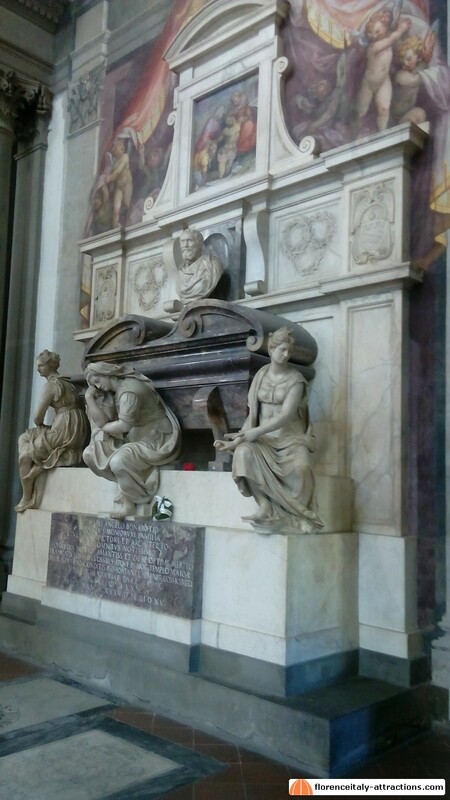 Giorgio Vasari designed Michelangelo’s tomb in Santa Croce, surmounted by three statues representing sculpture, painting and architecture.